If you live a healthy, active lifestyle or simply want to start one, you're at the right place! We all know that good physical health essentially boils down to keeping a sensible diet and getting exercise regularly. However, today's busy schedules can easily disrupt this balance. Many of us may find time to hit the gym, take a brisk morning walk or even get in a bike ride each day, yet too often resort to fast food at mealtimes. This can severely tip the scales out of your favor - pun intended! This is precisely where GymburritO®/GymburritO jr® Nutritional Products come into play and can help keep you on track to healthy living. So come on in and explore our newly renovated website. You'll find everything you need to know about our products, our company and what we've got cooking. 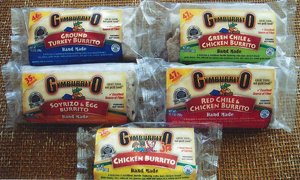 Click here for a GymburritO®/GymburritO jr® Nutritional Products Production Update.